I love seeing this family every year for their annual photos. My favorite thing (besides their amazing stylish outfits, sweet kicks and great style) is the personalities their little guys bring for me to capture. You never know what you're going to get when a little one has some of his own ideas for his poses, but he did awesome job providing me some great material. LOCATION TIPS: Love the look of this location? 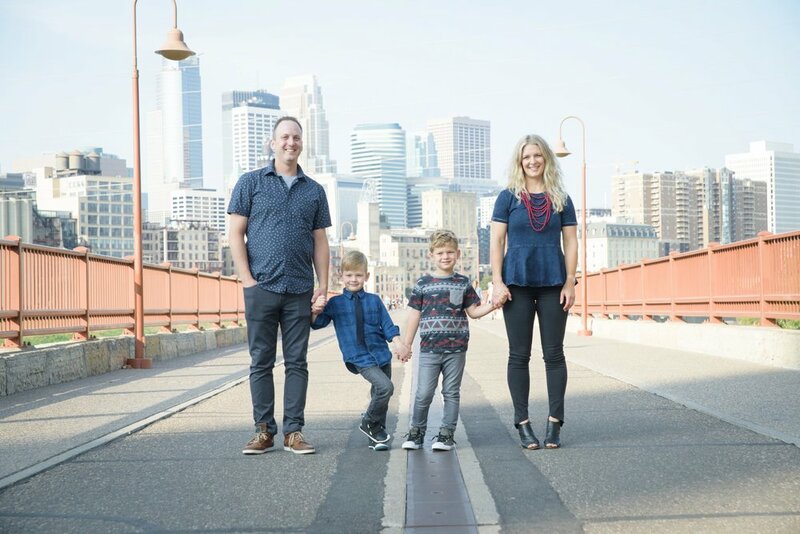 These were shot at the Historic Stone Arch Bridge and St Anthony Main Area. I love taking photos here but for the least amount of crowds and optimal light, early mornings are a must at this location. Weekends are not ideal but if you do your session early enough, you may avoid excess pedestrian and bike traffic. CLOTHING TIP: Whether you are On Location or In Studio, don't forget that your shoes are an important part of your outfit!!! And as I always, my best advice is to "coordinate, not match".